It seems like all Tahoe roads somehow lead to Squaw Valley. And so it is with Christy Hill Lakeside Bistro in Tahoe City. The restaurant originally opened some 38 years ago in the former home of Squaw co-founders Wayne and Sandy Poulsen; its name came from their son, Chris. “Chris’ godfather would call and ask Wayne Poulsen senior, the patriarch, ‘How’s that little Christy?’” says Robyn Sills, current co-owner of the upscale eatery, which moved to its lakeside location in the mid 1980s (Graham’s Restaurant & Bar has since occupied the former Poulsen digs). 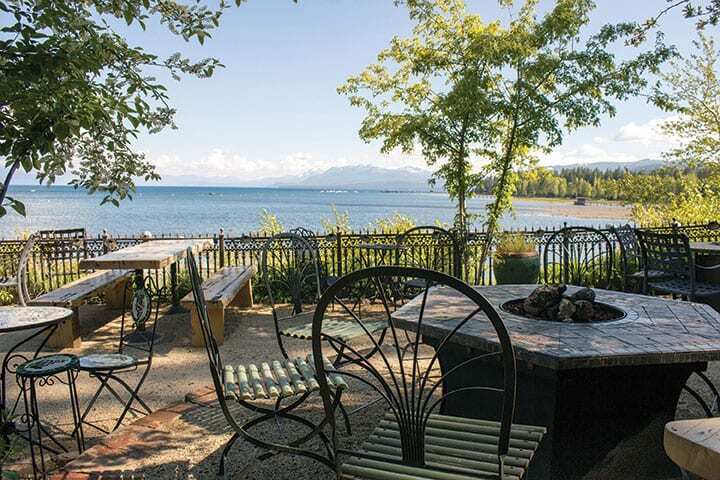 Veteran restaurateurs Sills and Ed Coleman bought Christy Hill seven years ago, changing its name to Christy Hill Lakeside Bistro and selling their Old Town Truckee restaurants Pacific Crest and Bar of America to Tom Turner of Gar Woods, Riva Grill and Caliente. The Colemans brought in business partners Nicole and Tom Beckering to manage their other Truckee property, Pianeta. Christy Hill Lakeside Bistro’s contemporary dining room, decorated with muted tones, wood beams and granite tabletops, boasts panoramic lake and mountain views and seating for up to 60 guests, with additional space in the elevated Lakeview bar area. A waterfront deck doubles dining capacity in the warmer months. Summer also sees the restaurant’s SandBar swing into action, with drinks and snacks served in a casual garden surrounding. Executive chef Andrew Shimer oversees a sophisticated Modern American menu that matches the restaurant’s setting. The Tahoe City native moved to San Francisco in 1999, honing his culinary skills under some of the city’s most notable chefs at top spots like Jardiniere, Boulevard, Aqua, Waterfront and Mezze in Oakland, overseeing the latter for five years before heading back to Tahoe in 2009. Upon his return to The Lake, he ran Fiamma, a popular Tahoe City Italian eatery. Shimer employs local, sustainably raised seasonal ingredients, many of which are procured via the Tahoe Food Hub, and a “technically updated Mediterranean approach” in his menus, making many products in-house, including cured pancetta, duck prosciutto and sausages. 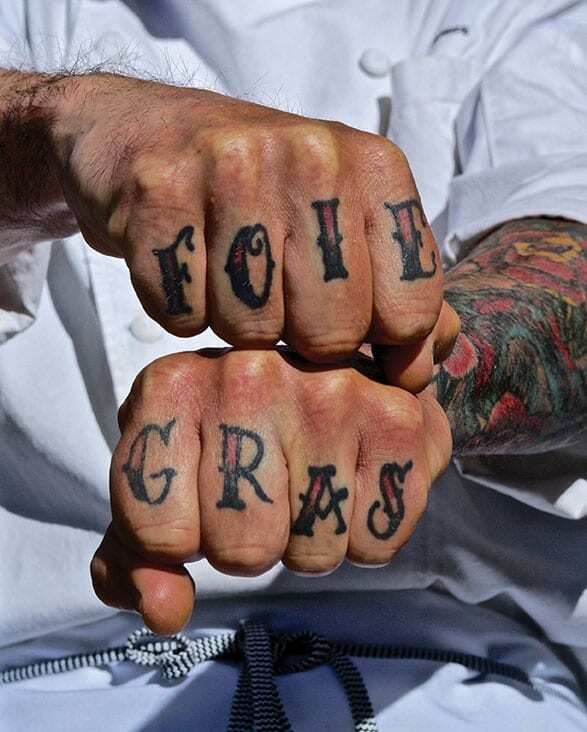 Of all charcuterie arts, however, he is most passionate about foie gras, so much so that he had the words tattooed on his fingers, in a knuckle sandwich of sorts. “My real passion and advocacy for this delicacy originally came from some people’s opinions on its humanity,” says Shimer of the oft-controversial dish. “Just like any food, you should know where it’s coming from. I know that the farm, La Belle, where we get our foie gras from, is as humane as possible. Sources outside this country can be horrific. But, some of the other practices here in the States can be even more sickening—chicken egg production, for instance. To that end, Shimer has served it seared on brioche pan perdu with vanilla bean macerated strawberries, braised endive, aged balsamic and mint—or as a simple shaved torchon on a seasonal sorbet. 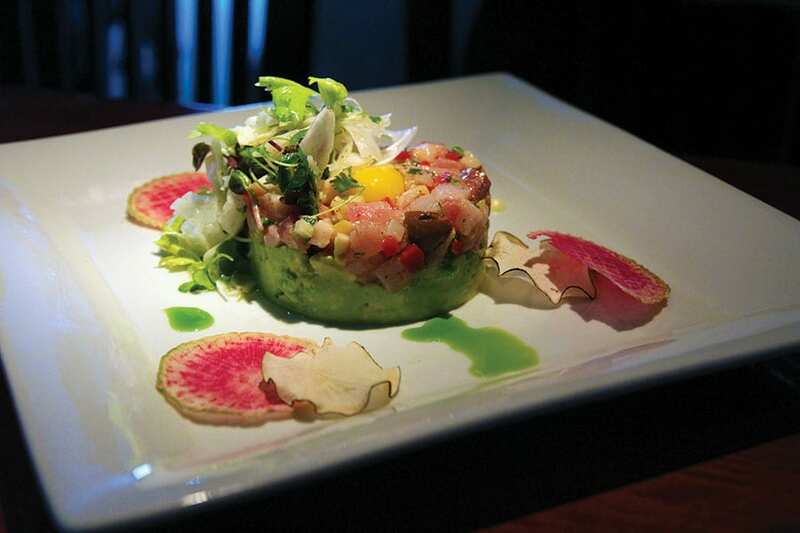 Shimer’s dishes are complex but clean. Flavor and texture shine in dishes that surely take much time, care and a touch of molecular gastronomy magic to prepare. Recent menu items include starters such as a delicate and delicious hamachi tartare with avocado, fennel, roasted peppers, celeriac, olives, radish, tarragon, preserved lemon aioli and quail egg, and a grilled octopus and royal red shrimp with pan-seared gnocchi, celeriac, apple, frisee and hazelnuts in a romesco broth. An apple and pear salad is tossed with endive, micro greens, vadouvan pepita brittle and citrus vinaigrette atop a creamy goat cheese base. The pan-roasted day boat scallop is served with coconut risotto, sea beans, a kale chip, pomegranate gastrique and uni foam, while a pan-roasted black cod comes with Manila clams, kohlrabi, potatoes, Napa cabbage and leek-fennel “fondue.” A fresh tagliatelle pasta gets dosed with black trumpet mushrooms, caramelized shallots, arugula, truffle butter and shaved cured egg yolk. Perhaps the longest-running favorite at the restaurant is the Moroccan-spiced lamb loin with celery root–pistachio puree, olive-stuffed piquillo peppers and charmoula sauce. For dessert, save room for the chocolate croissant bread pudding, the sticky banana toffee cake with peanut-bacon brittle, or local baker Liesl Panke’s espresso cheesecake or dark truffles. A Wine Spectator–awarded list with some 75 labels—ranging from a Truckee River Winery pinot to a Tuscan Brunello di Montalcino—is managed by Jim “J.B.” Budny, a longtime Tahoe server and sommelier (he’s an alum of Wolfdale’s and Boulevard) who knows his grapes. He is ably assisted by David Eisenstark, a familiar face formerly of Jack Rabbit Moon in Incline Village. 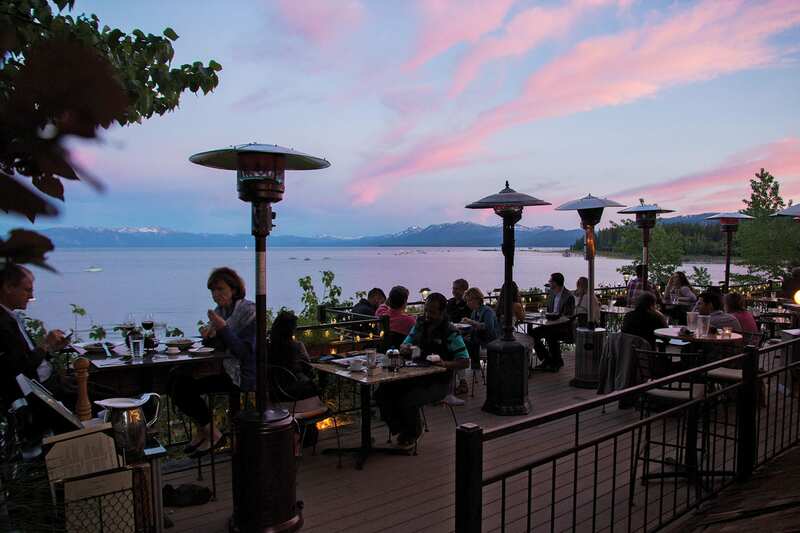 Take their recommendation for a glass of wine you might not otherwise sample, pop out to the restaurant’s deck on a Tahoe summer night and glance out in the direction of Squaw Valley’s peaks in the distance. And be glad that the road to that fabled resort is a short one. TQ Food & Wine editor Susan D. Rock looks forward to sipping a crisp Sancerre on the deck at Christy Hill this summer.